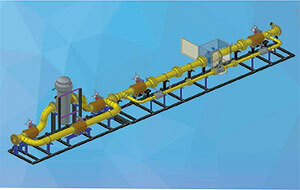 Metering unit (SKID) of platform performance intended is a finished prefabrication product designed to measure the flow rate and volume of natural gas adjusted to standard conditions, register, archive and remote data transmission to the controller or operator during gas transfer to the consumer. SKID is mounted on the outlet pipe. platform with two ultrasonic meters providing measurement of gas flow rate and volume during “winter” and “summer” periods. Measurement points can be made for use on pipes with a diameter of 80 to 300 mm, pressure of 6.3 MPa and a capacity from 1 to 6500 m3/h. PI-15/80-20 platform (meters for “winter” / “summer» periods – G1000-DN150 / G250-DN80, respectively, the outer flanges DN150). The base (platform) of the welded metal structure. Gas meters: the basis for the “winter” flow rates and the meters for small “summer” flow rates. Measuring lines with straight runs located before and after the meter, which meet the requirements of SOU 49.5-30019801-2014, State Standard GOST and DSTU GOST 8.586.1 8.586.2. Four STK-2.1.1 ball valves in the input and output of each meter. Set of standard mounting tools (pipes, tees, reducers, elbows). Two sets of the pressure and temperature transmitter with locking and mounting fittings. 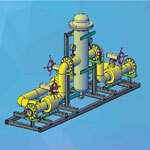 Additional equipment and appliances («Zanker» flow preparation device, control and measuring equipment, safety cabinets).